God reveals Himself to us through the things He has made. Lad Allen, founder of Illustra Media, believes in the power of preaching without words, and that the observation of the universe is one of the most powerful ways God reveals Himself to us. Illustra Media has made internationally acclaimed documentary films exploring the case for intelligent design in the universe for more than 20 years. 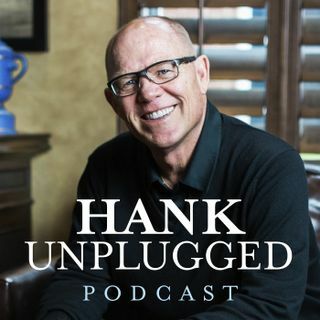 On this edition of Hank Unplugged, Hank and Lad discuss past productions of Illustra Media in addition ... See More to their shared excitement about the power of digital media to share the gospel through ventures such as Allen’s new John 10:10 Project. Topics discussed include: how Illustra Media has been able to produce internationally acclaimed documentary films making a scientific case for intelligent design in the universe (3:00); the power of a supportive spouse (5:20); the unique way that travelling can teach us (7:00); evoking a sense of wonder and general revelation through creation (8:30); metamorphosis as an example of intelligent design (10:55); having healthy relationships with people we disagree with (13:35); how advances in animation allow us to unveil and magnify complex scientific ideas in ways otherwise impossible (16:30); the metamorphosis of a caterpillar to a butterfly as an analogy for our resurrection in Christ (20:30); Bill Nye propagating Carl Sagan's materialist worldview that we are insignificant and alone in the universe (24:45); the vision of The John 10:10 Project (29:30); the power of digital media to share the gospel (33:20); working with Joni Eareckson Tada (43:30); a preview of upcoming short films by The John 10:10 Project (46:15); demonstrating the evidence of a designer by investigating God’s creation (51:00); Hank shares a personal testimony of God’s providence (53:25); investigating Messianic prophecy as a powerful apologetic tool (1:05:30); King of Creation: Meditation on God’s Wisdom and Works (1:09:40); the importance of reflecting the glory of God in all that we do and working for an audience of one (1:12:15); the best year of Hank’s life is the year he was diagnosed with cancer (1:58:30); how Illustra Media is able to produce monumental projects out of a spare bedroom (1:16:00).